Natural yoghurt is one of nature’s wonders full of goodness and nutrients – and so very versatile an ingredient that it can be added to fruits, cereals, sauces, marinades, puddings, smoothies, mousses, stews, soups, dressings – the list is almost endless! And it’s easy to make at home with just a sample of each batch reserved back to make the next from, providing an appetite-suppressing, healthy standalone snack and recipe ingredient. Dawn: I use so much natural yoghurt that I’m delighted to be able to share this recipe with you. And the health benefits of eating this creamy, slightly sharp tasting protein food are numerous including support of the immune system, less constipation, stomach acidity and diarrhoea; lower body fat; protection against food poisoning bugs; stronger bones and fresher breath. All in all, a versatile win-win fridge staple that you can keep making all-year-round – and for mere pennies rather than pounds! Put the milk in a saucepan on a medium heat and add the powdered milk, stirring it in. 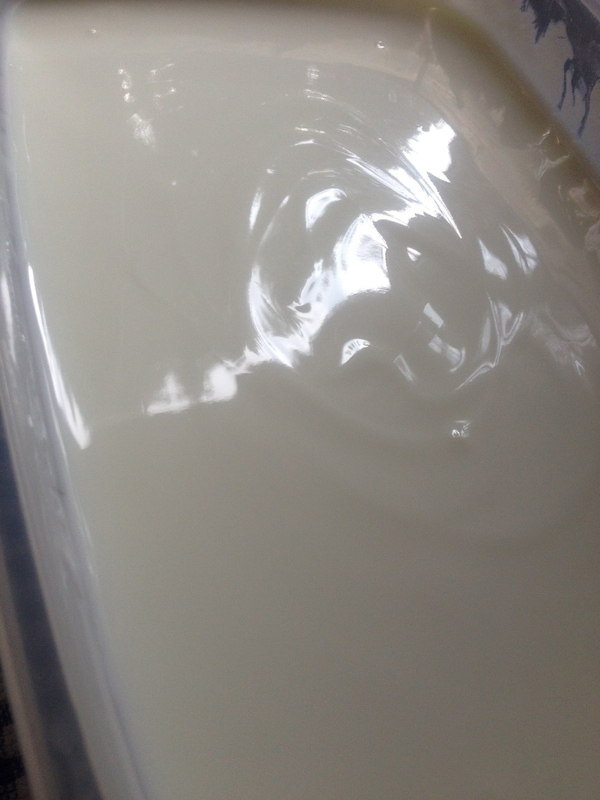 Keep stirring the milk until you can see heat bubbles appear on the edges of the yoghurt mixture as it is warming up. Take the saucepan off the heat and using a cooking thermometer, test the yoghurt mixture to determine its temperature. Cool to 46°C and add the retained shop bought low-fat natural yoghurt, stirring this in until it is dissolved. Dawn: Please make sure that you allow the milk to cool to 46°C before adding the reserved shop bought natural yoghurt because if the temperature is too high, you run the risk of the ingredients curdling. Pour the yoghurt mixture either into a warm thermos (vacuum) flask or a warm bowl, cover the bowl with cling film and leave the yoghurt mixture to set for about 8-9 hours or overnight in a warm place. If using the latter option, warming the bowl prior to adding the yoghurt mixture helps it ferment and then store it in a warm place afterwards. After allowing the ingredients to ferment, the consistency should be not too firm but thickish and ready to store in a container in the fridge. Don’t pour off the watery-looking liquid that is the whey and packed full of protein but simply stir it into the creamy yoghurt as it’s part of it. The yoghurt will easily keep for about 5-7 days. Dawn: Remember to keep some yoghurt back to make the next batch with. I’d also add that investing in a cooking thermometer really does help ensure that the yoghurt mixture is at the right temperature before you add the reserved natural yoghurt. Being at the right temperature stops the yoghurt mixture from curdling as I have learnt from experience! It goes without saying that the variety of milks that are available in the shops nowadays along with the different brands of powdered milks will all add a different taste and consistency to your homemade natural yoghurt. All will be equally nutritious and good for you. Happy yoghurt making! For more thrifty and economical, tasty and easy to make food recipes, follow this blog – www.forfoodlovers.wordpress.com and click “Follow” over on Twitter @Love_Food_UK for regular food chat as well as finding the cooking sensation over on Facebook (please pop across and ‘Like’ Love Food). Oh, not forgetting the fab MumsNet Bloggers Network and Foodies100, too! 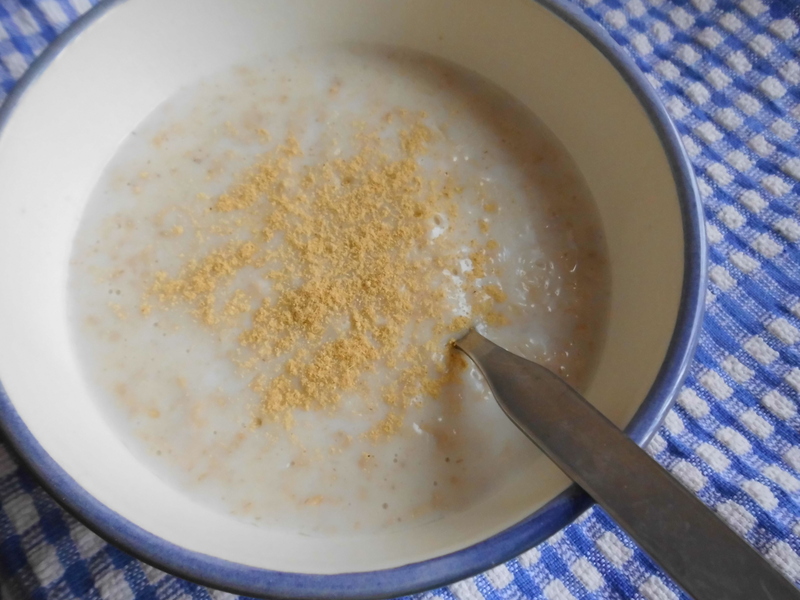 A slow energy release food, porridge keeps us feeling full, longer. It’s also a great contributor to helping lower our cholesterol. 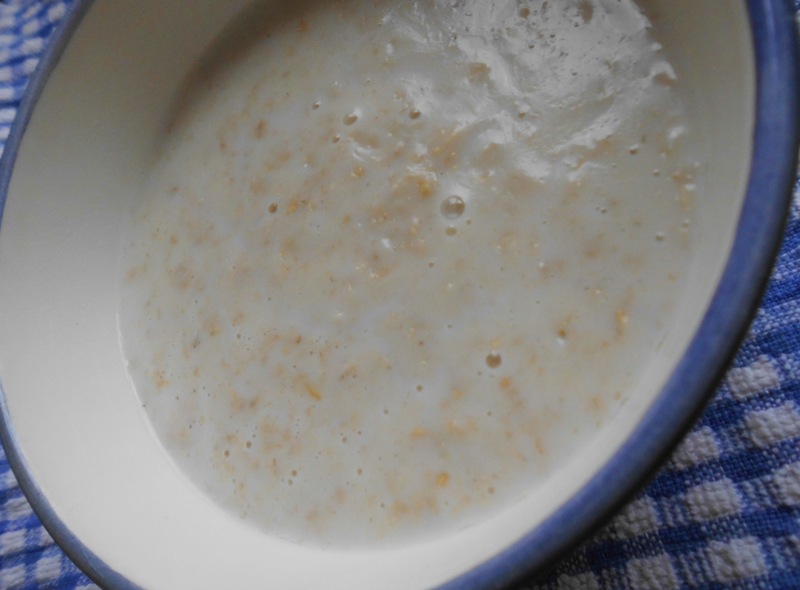 Put the porridge oats in a saucepan and add the water or milk. Place the saucepan on a low to medium heat and stir constantly. The the mixture will start to thicken and become creamy in look and texture. Dawn: There’s no need to measure the ingredients as it’s relatively easy to use a ratio of 2:1 – 2 parts liquid to 1 part porridge oats. Andrew: Yes, a half mug of porridge oats plus a full mug of water or milk. Quick and easy: just what our “How to” range is all about! For more in the Cooking Duo’s “How to” range and more recipes, follow this blog – www.forfoodlovers.wordpress.com – and our Twitter account @Love_Food_UK. You’ll also find us on Mumsnet Bloggers Network and Foodies100…oh, and did we mention Facebook? See you there for more fab food chat! 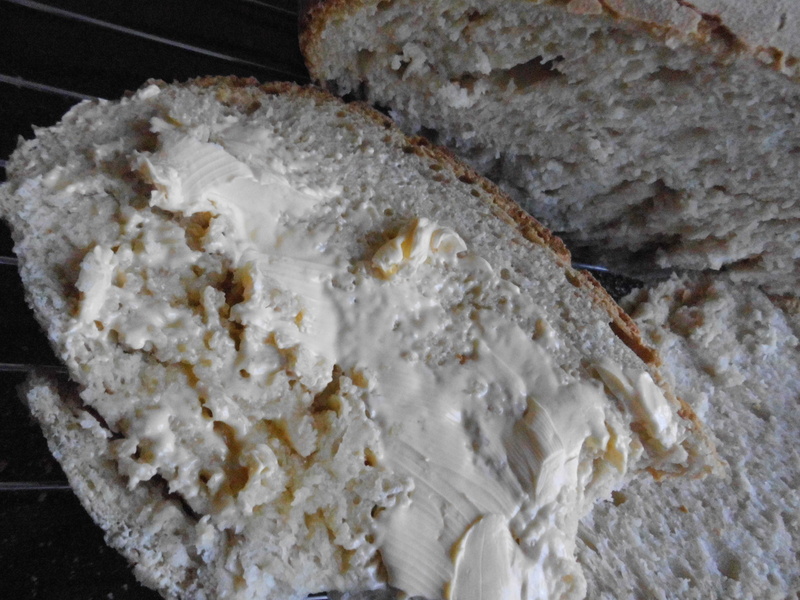 Our “How to Make Bread” recipe really does knead – get it? – the know-how on how to knead it so we’re setting out a few simple steps here for you to get to know how to work those magical few ingredients that make such a staple cupboard necessity for many. When making the dough, try to warm the bowl to speed up the process. Measure all the ingredients – don’t guess the weights! You’re unlikely to guess correctly. Add the yeast liquid to the dry ingredients using a wooden spoon or fork until they are blended together. Work the dough until all the ingredients are combined, the dough is smooth in appearance and leaves the sides of the bowl clean. This is the essential part of making bread. Kneading strengthens the gluten in the flour, making the dough elastic-like in texture and enables the dough to rise more easily. Turn the dough out onto a flour-dusted work surface and knead it by folding it towards you then quickly and firmly pushing it down and away from you with the heel of your hand. Give the dough a quarter turn and continue kneading in the same way as described kneading towards you and then pushing the dough from you for about 10 minutes until it is firm, elastic and non-sticky. 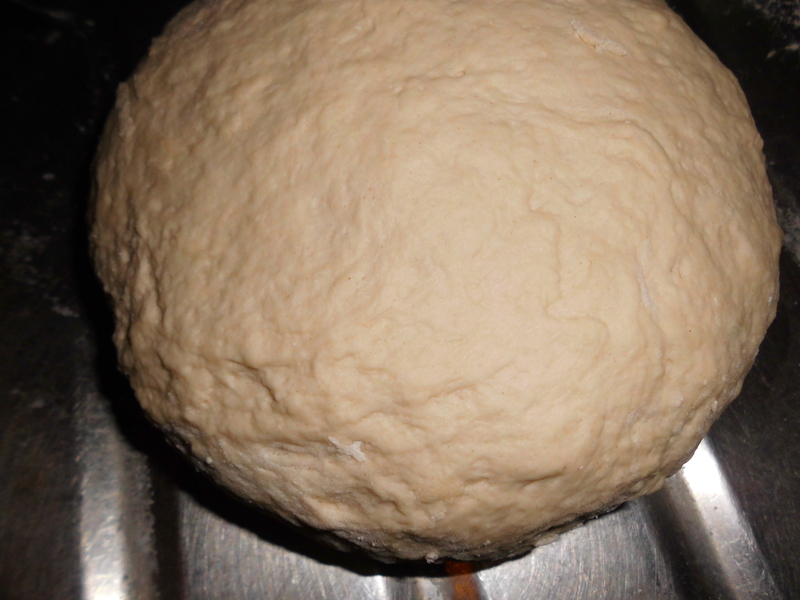 Once kneaded, the dough is ready for rising. Place in a bowl and cover the bowl with cling film. Rising times may vary with temperature. Allow 1.5 – 2 hours at room temperature for the dough to rise. 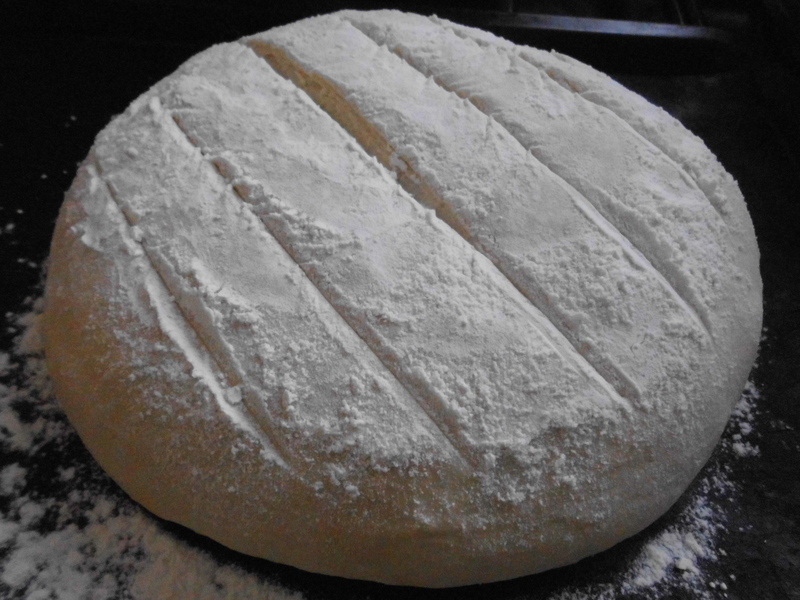 It should be double in size and the risen dough should spring back to its original shape when gently pressed with a floured finger. The dough’s rising time can be quickened by placing it in a warm place such as an airing cupboard or on top of a radiator for about 45-60 minutes until it is twice its original size. A second, short 2 – 3 minutes kneading and then shape, pop onto a baking tray and put in the oven. For regular cooking tips and food advice from the Cooking Duo, simply follow this blog by popping your email address in the box as indicated at www.forfoodlovers.wordpress.com or if you’re a blogger, too, Follow us. We want to get to know you, too! If you’re a fellow tweeter, we want to tweet with you, too! We’re @Love_Food_UK so let’s tweet together very soon! And you’ll find us on Facebook, Mumsnet Bloggers Network and Foodies100, too. See you over there soon, we hope! Happy bread making!